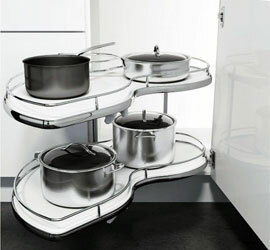 Base Corner Motion Shelves with Door Mounted Left to Lid. 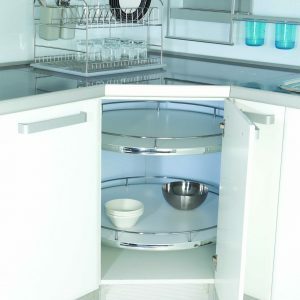 Fits in 21" wide Frame Corner Cabinet openning OR 18" wide Frameless Corner Cabinet opening. Base Corner Motion 2 x Cloud Shelves Extend to Left. 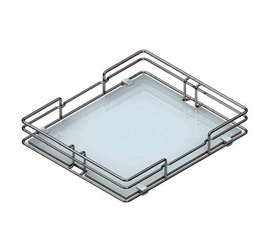 Fits in 21" wide Frame Corner Cabinet openning OR 18" wide Frameless Corner Cabinet opening. Base Corner Motion Shelves with Door Mounted Right to Lid. 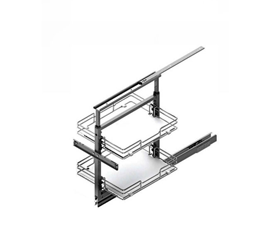 Fits in 21" wide Frame Corner Cabinet openning OR 18" wide Frameless Corner Cabinet opening. Base Corner Motion 2 x Turning Trays set, without Tube. 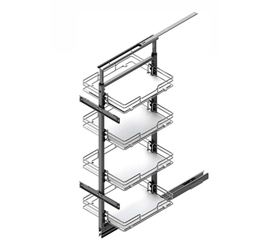 Fits in 21" wide Frame Corner Cabinet openning OR 18" wide Frameless Corner Cabinet opening. 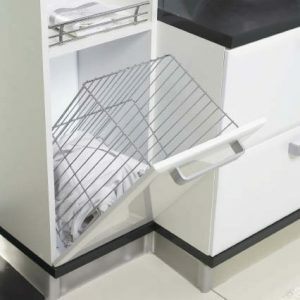 Base Motion Tilt out Storage Basket. 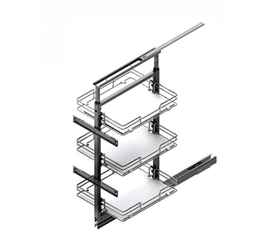 Fits in 18" wide Frame Cabinet OR 15" wide Frameless Cabinet. Base Motion Tilt out Storage Basket. Fits in 21" wide Frame Cabinet OR 18" wide Frameless Cabinet. Base Organizer, WorkBench with Bottle Divider. Fits in 21" wide Frame Cabinet OR 18" wide Frameless Cabinet. Base Organizer, WorkBench with Bottle Divider, Knives Holder, Dinningware Slot. Fits in 21" wide Frame Cabinet OR 18" wide Frameless Cabinet. 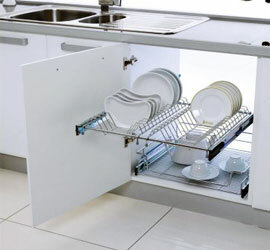 Base Shelf Plate Holder with Full Extension. Fits in 27" wide Frame Cabinet OR 24" wide Frameless Cabinet. 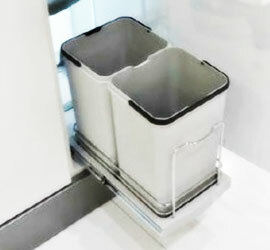 Base Waste Bin with Door Pull Open Lid. 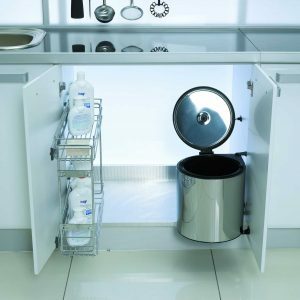 Fits in 18" wide Frame Cabinet or 15" wide Frameless Cabinet, Fits under regular 36" Sink Base Cabinet. 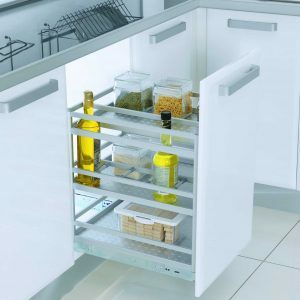 Telescopic Larder with 3 Full Extension Wooden Bottom Shelves. Fits in 15" wide Frame Cabinet OR 12" wide Frame less Cabinet. 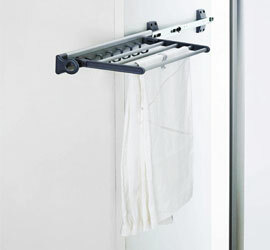 Adjustable Height fits Multiple Door Sizes. 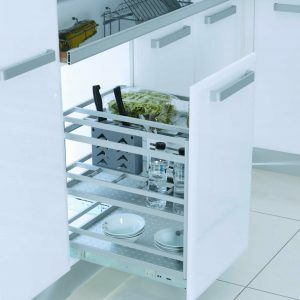 Telescopic Larder Basket with Woodern Bottom. Fits in 15" wide Frame Cabinet OR 12" wide Frame less Cabinet. Telescopic Larder with 2 Full Extension Wooden Bottom Shelves. Fits in 15" wide Frame Cabinet OR 12" wide Frame less Cabinet. Adjustable Height fits Multiple Door Sizes. 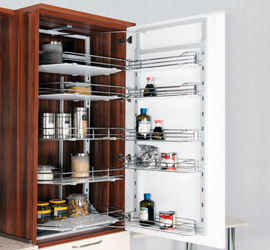 Telescopic Larder with 4 Full Extension Wooden Bottom Shelves. Fits in 18" wide Frame Cabinet OR 15" wide Frame less Cabinet. Adjustable Height fits Multiple Door Sizes. Telescopic Larder with 3 Full Extension Wooden Bottom Shelves. Fits in 18" wide Frame Cabinet OR 15" wide Frame less Cabinet. Adjustable Height fits Multiple Door Sizes. 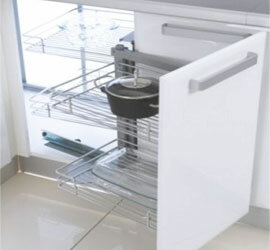 Telescopic Larder Basket with Woodern Bottom. Fits in 18" wide Frame Cabinet OR 15" wide Frame less Cabinet. Telescopic Larder with 2 Full Extension Wooden Bottom Shelves. Fits in 18" wide Frame Cabinet OR 15" wide Frame less Cabinet. Adjustable Height fits Multiple Door Sizes.